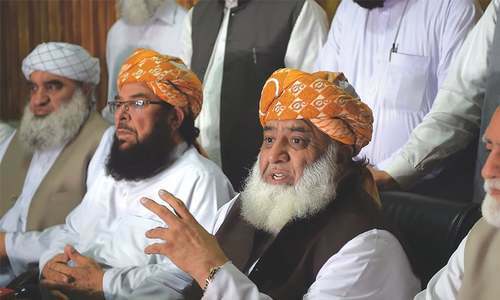 PESHAWAR, Oct 19: The Muttahida Majlis-i-Amal (MMA)’s victory in the Oct 10 polls has apparently paved the way for the NWFP to come under the direct rule of religious parties for the second time since the inception of Pakistan. This second opportunity to head the provincial government has come to the religious parties’ way after a gap of over 28 years and eight months. The late Maulana Mufti Mehmood had the distinction to do so the first time round. 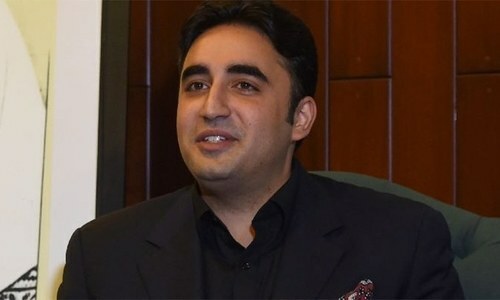 However, his reign lasted only nine months and 12 days after he stepped down from the office of chief minister, NWFP, on Feb 15, 1973, in protest against the removal of the then Balochistan government by prime minister Zulfiqar Ali Bhutto. Keeping intact its supremacy over other religious parties, JUI appears to be set to head the new provincial government in the NWFP. In line with the power-sharing arrangement, agreed upon by the MMA’s component parties, the chief minister’s slot would go to the JUI whereas speaker of the provincial assembly would be from amongst the Jamaat-i-Islami’s MPAs-elect. The religious parties’ conglomerate won 48 out of the total 99 general seats in the provincial assembly. It enjoys a simple majority of over 62 members required to form the government. In the post-election scenario, several of the 14 independently elected MPAs have opted to join MMA, further strengthening its hands. Hence, Akram Ullah Khan Durani, the JUI(F)’s nominee for the coveted slot, has much greater prospects to become the 20th chief minister of the Frontier province since independence in 1947. Of the 19 CMs who led the provincial government since the country’s independence, 11 were replaced in quick succession during the last 15 years following the restoration of lame democracy in Pakistan with the establishment of Mohammed Khan Junejo’s government in 1985. Dr Khan Sahib, brother of Wali Khan’s father Khan Abdul Ghaffar Khan, was the chief executive of the province at the time of independence in 1947. He relinquished the office on Aug 22, 1947, after remaining chief minister from March 16, 1945. He was succeeded by Khan Abdul Qayum Khan who assumed the office of chief minister on Aug 23, 1947 and held it till April 23, 1953. He was replaced by Sardar Abdur Rashid Khan who remained chief executive of the province till July 18, 1955. He was succeeded by Sardar Bahadur Khan who was sworn in as CM on July 27, 1955 and held the office only for two months. Maulana Mufti Mehmood remained CM from May 1, 1972 to Feb 15, 1973. He was succeeded by Sardar Inayatullah Gandapur who led the provincial government from May 29, 1974 to Feb 17, 1975. Gandapur was succeeded as chief minister by Khan Nasrullah Khan Khattak was assumed the office on May 3, 1975 and left the post on April 8, 1977. He was taken over by Mohammed Iqbal Khan Jadoon who became the CM on April 9, 1977, and was removed on July 5, 1977 - the day the military dictator Zia-ul-Haq staged a coup against Bhutto. Arbab Mohammed Jehangir became the first chief minister of NWFP after democracy was restored through party-less elections in 1985. He held this office for around three years from April 7, 1985 to May 30, 1988. The dissolution of the provincial assembly in 1988 helped Lt-Gen Fazal-i-Haq to become acting chief minister of the province. He remained in the office from May 31, 1988 to Dec 2, 1988. Aftab Ahmed Khan Sherpao, then associated with the mainstream Pakistan People’s Party, became chief minister on Dec 2, 1988 and held the office till Aug 8, 1990. Mir Afzal Khan was brought in as the caretaker chief minister of the province for a period of three months. Later Mir Afzal Khan got elected as the CM following the Islami Jamhoori Ittehad’s landslide victory in the 1990 elections. Mir Afzal Khan was again chosen for the caretaker chief minister’s job with Mir Balkh Sher Mazari serving as head of interim government. He was replaced by another interim period chief minister, Mufti Abbas, who was installed in the caretaker government led by Moeen Qureshi whose team completed the transfer of power in Oct, 1993 following general elections. Although Benazir Bhutto was sworn in as prime minister, in the NWFP a coalition of ANP and PML jointly formed government with Pir Sabir Shah of PML chosen as the chief minister. Upon getting voted out, Mr Shah was replaced by Aftab Ahmed Khan Sherpao who remained in the office till Nov 12, 1996 — when he was removed by the then President Farooq Ahmed Khan Leghari. Following the dissolution of provincial assembly, Raja Sikandar Zaman was installed as the caretaker chief minister. He was succeeded by the PML-ANP’s joint nominee Sardar Mehtab Ahmed Khan who could hardly hold the office till Oct 12, 1998.